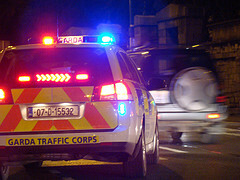 Gardaí investigating a traffic collision which occurred on the 20th of February 2012 are appealing for witnesses. The crash happened at approximately 7.30am on Swords Road, Cloghran, north of the Main Dublin Airport Roundabout. An articulated lorry and a cyclist were involved in the incident and the cyclist received serious injuries and was taken to Beaumont Hospital. The driver of the truck remained at the scene and was uninjured. Gardaí are appealing to any person who was in the area at the time and may have witnessed the incident to contact Gardai at Dublin Airport, Telephone 01-6664950 or any Garda Station.